Frank Owen Gehry, CC (born Frank Owen Goldberg; (1929-02-28)28 February 1929) is a Canadian-born American architect, residing in Los Angeles. A number of his buildings, including his private residence, have become world-renowned attractions. His works are cited as being among the most important works of contemporary architecture in the 2010 World Architecture Survey, which led Vanity Fair to label him as "the most important architect of our age". Gehry's best-known works include the titanium-clad Guggenheim Museum in Bilbao, Spain; Walt Disney Concert Hall in downtown Los Angeles; Louis Vuitton Foundation in Paris, France; MIT Ray and Maria Stata Center in Cambridge, Massachusetts; The Vontz Center for Molecular Studies on the University of Cincinnati campus; Museum of Pop Culture in Seattle; New World Center in Miami Beach; Weisman Art Museum in Minneapolis; Dancing House in Prague; the Vitra Design Museum and the museum MARTa Herford in Germany; the Art Gallery of Ontario in Toronto; the Cinémathèque française in Paris; and 8 Spruce Street in New York City. It was his private residence in Santa Monica, California, that jump-started his career. Gehry is also the designer of the future National Dwight D. Eisenhower Memorial. Gehry was born Frank Owen Goldberg on February 28, 1929, in Toronto, Ontario, to parents Sadie Thelma (née Kaplanski/Caplan) and Irving Goldberg. His father was born in Brooklyn, New York, to Russian Jewish parents, and his mother was a Polish Jewish immigrant. A creative child, he was encouraged by his grandmother, with whom he would build little cities out of scraps of wood. With these scraps from her husband's hardware store, she entertained him for hours, building imaginary houses and futuristic cities on the living room floor. His use of corrugated steel, chain link fencing, unpainted plywood and other utilitarian or "everyday" materials was partly inspired by spending Saturday mornings at his grandfather's hardware store. He would spend time drawing with his father, while his mother introduced him to the world of art. "So the creative genes were there", Gehry says. "But my father thought I was a dreamer, I wasn't gonna amount to anything. It was my mother who thought I was just reticent to do things. She would push me." He was given the Hebrew name "Ephraim" by his grandfather, but only used it at his bar mitzvah. In 1947, his family immigrated to the United States settling in California. Gehry got a job driving a delivery truck, and studied at Los Angeles City College, eventually to graduate from the University of Southern California's School of Architecture. During that time, he became a member of Alpha Epsilon Pi. According to Gehry, "I was a truck driver in L.A., going to City College, and I tried radio announcing, which I wasn't very good at. I tried chemical engineering, which I wasn't very good at and didn't like, and then I remembered. You know, somehow I just started wracking my brain about, 'What do I like?' Where was I? What made me excited? And I remembered art, that I loved going to museums and I loved looking at paintings, loved listening to music. Those things came from my mother, who took me to concerts and museums. I remembered Grandma and the blocks, and just on a hunch, I tried some architecture classes." Gehry graduated with a Bachelor of Architecture degree from USC in 1954. After graduating from college, he spent time away from the field of architecture in numerous other jobs, including service in the United States Army. In the fall of 1956, he moved his family to Cambridge, where he studied city planning at the Harvard Graduate School of Design. He left before completing the program, disheartened and underwhelmed. Gehry's left-wing ideas about socially responsible architecture were under-realized, and the final straw occurred when he sat in on a discussion of one professor's "secret project in progress"—a palace that he was designing for right-wing Cuban dictator Fulgencio Batista (1901–1973). Gehry returned to Los Angeles to work for Victor Gruen Associates, who he had apprenticed for while at USC School of Architecture. In 1958 he was given the chance to design and construct his first private residence at the age of 28, with friend and old classmate Greg Walsh. Built in Idyllwild, California for his wife Anita’s family neighbor Melvin David, "The David Cabin" shows features that were to become prominent in later work. The over 2,000 square foot mountain retreat has unique design features with prominent Asian influences, stemming from his earliest inspirations at the time like Shosoin Treasure House in Nara, Japan, among others. Beams protrude from the exterior sides and exposed, unfinished ceiling beams are prominent features. In 1961, he moved to Paris where he worked for architects Pereira and Lickman. In 1962, Gehry established a practice in Los Angeles which became Frank Gehry and Associates in 1967 and then Gehry Partners in 2001. Gehry's earliest commissions were all in Southern California, where he designed a number of innovative commercial structures such as Santa Monica Place (1980) and residential buildings such as the eccentric Norton House (1984) in Venice, California. Among these works, however, Gehry's most notable design may be the renovation of his own Santa Monica residence. Originally built in 1920 and purchased by Gehry in 1977, the house features a metallic exterior wrapped around the original building that leaves many of the original details visible. Gehry still resides there today. Other completed buildings designed by Gehry during the 1980s include the Cabrillo Marine Aquarium (1981) in San Pedro and the California Aerospace Museum (1984) at the California Museum of Science and Industry in Los Angeles. In 1989, Gehry was awarded the Pritzker Architecture Prize. The jury cited Gehry as "Always open to experimentation, he has as well a sureness and maturity that resists, in the same way that Picasso did, being bound either by critical acceptance or his successes. His buildings are juxtaposed collages of spaces and materials that make users appreciative of both the theatre and the back-stage, simultaneously revealed." Though Gehry continued to design other notable buildings in California such as the Chiat/Day Building (1991) in Venice in collaboration with Claes Oldenburg, which is well known for its massive sculpture of binoculars, he also began to receive larger national and international commissions. These include Gehry's first European commission, the Vitra International Furniture Manufacturing Facility and Design Museum in Germany completed in 1989. This was soon followed by other major commissions including the Frederick Weisman Museum of Art (1993) in Minneapolis, Minnesota, the Cinémathèque Française (1994) in Paris, France, and the Dancing House (1996) in Prague, Czech Republic. In 1997, Gehry vaulted to a new level of international acclaim when the Guggenheim Museum Bilbao opened in Bilbao, Spain. Hailed by New Yorker Magazine as a "masterpiece of the twentieth century" and legendary architect Philip Johnson as "the greatest building of our time", the museum became famous for its striking yet aesthetically pleasing design and the economic effect that it had on the city. Since then, Gehry has regularly won major commissions and has further established himself as one of the world's most notable architects. His best received works include several concert halls for classical music, such as the boisterous and curvaceous Walt Disney Concert Hall (2003) in Downtown Los Angeles, which has been the centerpiece of the neighborhood's revitalization and has been labeled by the LA Times as "the most effective answer to doubters, naysayers, and grumbling critics an American architect has ever produced", the open-air Jay Pritzker Pavilion (2004) adjacent to Millennium Park in Chicago, and the understated New World Center (2011) in Miami Beach, which the LA Times called "a piece of architecture that dares you to underestimate it or write it off at first glance." Other notable works include academic buildings such as the Stata Center (2004) at MIT and the Peter B. Lewis Library (2008) at Princeton University, museums such as the Museum of Pop Culture (2000) in Seattle, Washington, commercial buildings such as the IAC Building (2007) in New York City, and residential buildings such as Gehry's first skyscraper, the Beekman Tower at 8 Spruce Street (2011) in New York City. Several recent and ongoing major works by Gehry around the world include the Dr Chau Chak Wing Building in the University of Technology, Sydney, completed in 2014. The Chau Chak Wing, with its 320,000 bricks in "sweeping lines" is described as "10 out of 10" on a scale of difficulty. An ongoing project is the Guggenheim Abu Dhabi on Saadiyat Island in the United Arab Emirates. Other significant projects such as the Mirvish Towers in Toronto, and a multi-decade renovation of the Philadelphia Museum of Art are currently in the design stage. In October 2013, Gehry was appointed joint architect with Foster + Partners to design the "High Street" phase of the development of Battersea Power Station in London, England, which will represent Gehry's first project in London. However, in recent years, some of Gehry's more prominent designs have failed to go forward. In addition to unrealized designs such as a major Corcoran Art Gallery expansion in Washington, D.C., and a new Guggenheim museum near the South Street Seaport in New York City, Gehry was notoriously dropped by developer Bruce Ratner from the Pacific Park redevelopment project and was also dropped in 2014 as the designer of the World Trade Center Performing Arts Center; both of these projects were in New York City. That said, some stalled projects have recently shown progress: after many years and a dismissal, Gehry was recently reinstated as architect for the Grand Avenue Project in Los Angeles and, though Gehry's controversial  design of the National Dwight D. Eisenhower Memorial in Washington, D.C., has been subject to numerous delays during the approval process with the United States Congress, the project was finally approved in 2014 with a modified design. 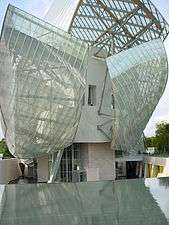 In 2014, two significant, long-awaited museums designed by Gehry opened: the Biomuseo, a biodiversity museum in Panama City, Panama, and the Fondation Louis Vuitton, a modern art museum in the Bois de Boulogne park in Paris, France, which opened to some rave reviews. Also in 2014, Gehry was commissioned by the Los Angeles River Revitalization Corporation, a nonprofit group founded by the city of Los Angeles in 2009 to coordinate river policy, to devise a wide-ranging new plan for the river. In February 2015 the new building for the University of Technology, Sydney was officially opened, with a façade constructed from more than 320,000 hand-placed bricks and glass slabs, and costing AU$180 million. Gehry said he would "never again design a building quite like the "crumpled paper bag". Reports in 2016 said that Gehry told the French newspapers La Croix and Le Figaro that he had spoken with French President Francois Hollande, who had assured the architect that he could relocate to France if Donald Trump was elected President of the United States. Gehry and Trump have a long-standing dispute, which may have originated when Gehry's 8 Spruce Street, originally known as the "Beekman Tower" was built 1 foot (0.30 m) taller than Trumps's nearby The Trump Building, thus beating the latter out as the tallest residential building in New York City – although both have since been surpassed by One57. One the other hand, Trump, as well as New Jersey Governor Chris Christie were said in August 2016 to be investors in Gehry's proposed "8150 Sunset [Boulevard] Project" in Los Angeles. Much of Gehry's work reflects a spirit of experimentation coupled with a respect for the demands of professional practice. Gehry's work has remained largely unaligned with broader stylistic tendencies or movements. With his earliest educational influences rooted in modernism, Gehry's work has sought to escape modernist stylistic tropes while still remaining interested in some of its underlying transformative agendas. Continually working between given circumstances and unanticipated materializations, Gehry's style works to disrupt expectations. Gehry is sometimes associated with what is known as the "Los Angeles School" or the "Santa Monica School" of architecture. The appropriateness of this designation and the existence of such a school, however, remains controversial due to the lack of a unifying philosophy or theory. 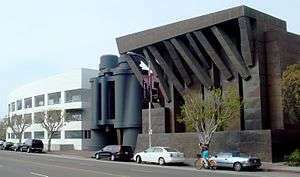 This designation stems from the Los Angeles area's producing a group of the most influential postmodern architects, including such notable Gehry contemporaries as Eric Owen Moss and Pritzker Prize-winner Thom Mayne of Morphosis, as well as the famous schools of architecture at the Southern California Institute of Architecture (co‑founded by Mayne), UCLA, and USC where Gehry is a member of the board of directors. Gehry's style at times seems unfinished or even crude, but his work is consistent with the California "funk" art movement in the 1960s and early 1970s, which featured the use of inexpensive found objects and non-traditional media such as clay to make serious art. Gehry has been called "the apostle of chain-link fencing and corrugated metal siding". However, a retrospective exhibit at New York's Whitney Museum in 1988 revealed that he is also a sophisticated classical artist, who knows European art history and contemporary sculpture and painting. Fish sculpture located in front of the Port Olímpic, in Barcelona, Catalonia, Spain. 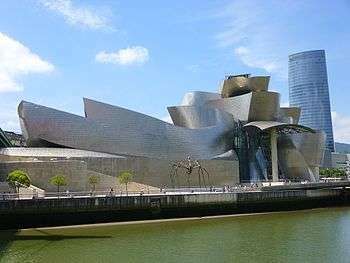 After the phenomenal success of Gehry's design for the Guggenheim Museum in Bilbao, Spain, critics began referring to the economic and cultural revitalization of cities through iconic, innovative architecture as the "Bilbao effect". In the first 12 months after the museum was opened, an estimated US$160 million were added to the Basque economy. In subsequent years there have been many attempts to replicate this effect through large-scale eye-catching architectural commissions that have been both successful and unsuccessful, such as Daniel Libeskind's expansion of the Denver Art Museum and buildings by Gehry himself such as the almost universally well-received Walt Disney Concert Hall in Los Angeles and the more controversial Museum of Pop Culture in Seattle. Though some link the concept of the Bilbao Effect to the notion of starchitecture, Gehry has consistently rejected the label of a starchitect. Though much of Gehry's work has been well-received, reception of Gehry's work is not always positive. Art historian Hal Foster reads Gehry's architecture as, primarily, in the service of corporate branding. Criticism of his work includes complaints that the buildings waste structural resources by creating functionless forms, do not seem to belong in their surroundings and are apparently designed without accounting for the local climate. In January 2011, Gehry joined the University of Southern California (USC) faculty, as the Judge Widney Professor of Architecture. He has since continued in this role at his alma mater. As of December 2013, Gehry has received over a dozen honorary degrees from various universities (see #Honorary doctorates). In 2004, he voiced himself on the children's TV show Arthur, where he helped Arthur and his friends design a new treehouse. Gehry also voiced himself in the 2005 episode of The Simpsons called "The Seven-Beer Snitch", in which he designs a concert hall for the fictional city of Springfield. Gehry has since voiced that he regrets his appearance since a joke about his design technique has led people to misunderstand his architectural process. Though Gehry is often referred to as a "starchitect", Gehry has repeatedly expressed his disdain for the term, insisting instead that he is only an architect. Steve Sample, President of the University of Southern California, told Gehry that "...After George Lucas, you are our most prominent graduate". In 2006, filmmaker Sydney Pollack made a documentary about Gehry's work called Sketches of Frank Gehry. The film, which followed Gehry over the course of five years and painted a positive portrait of his character, was well-received critically. In 2009, architecturally-inspired ice cream sandwich upstart Coolhaus named a cookie and ice cream combination after Gehry. Dubbed the "Frank Behry", it features Strawberries & Cream gelato and snickerdoodle cookies. Gehry is also known for his sometimes cantankerous personality. During a trip to Oviedo, Spain, to accept the prestigious Prince of Asturias Award in October 2014, he received a significant amount of attention, both positive and negative, for publicly flipping off a reporter at a press conference who accused him of being a "showy" architect. Gehry has been involved in exhibition designs at the Los Angeles County Museum of Art dating back to the 1960s. In 1965 Gehry designed the exhibition display for the "Art Treasures of Japan" exhibition at the LACMA. This was followed soon after by the exhibition design for the "Assyrian Reliefs" show in 1966 and the "Billy Al Bengston Retrospective" in 1968. The LACMA then had Gehry design the installation for the "Treasures of Tutankhamen" exhibition in 1978 followed by the "Avant-Garde in Russia 1910–1930" exhibition in 1980. 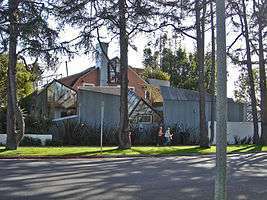 The subsequent year Gehry designed the exhibition for "Seventeen Artists in the 60's" at the LACMA followed soon after by the "German Expressionist Sculpture Exhibition" in 1983. In 1991/92, Gehry designed the installation of the landmark exhibition "Degenerate Art: The Fate of the Avant-Garde in Nazi Germany", which opened at the Los Angeles County Museum of Art and traveled to the Art Institute of Chicago, the Smithsonian Institution in Washington and the Altes Museum in Berlin. In 2014, Gehry was asked to design an exhibition on the work of Alexander Calder at the Los Angeles County Museum of Art's Resnick Pavilion, again invited by the museum's curator Stephanie Barron. The exhibition began on November 24, 2013, and ran through July 27, 2014. In addition to his long-standing involvement with exhibition design at the LACMA, Gehry has also designed numerous exhibition installations with other institutions. In 1998, "The Art of the Motorcycle" exhibition opened at the Solomon R. Guggenheim Museum with its installation designed by Gehry. This exhibition subsequently traveled to the Field Museum of Natural History in Chicago, the Guggenheim Museum in Bilbao and the Guggenheim Las Vegas. In 2012 Gehry designed the set for the Los Angeles Philharmonic's opera production of "Don Giovanni" held at the Walt Disney Concert Hall. In 2014, he also curated an exhibition of photography by his close friend and businessman Peter Arnell that ran from March 5 through April 1 at Milk Studios Gallery in Los Angeles. In April 2014 Gehry designed a set for an "exploration of the life and career of Pierre Boulez" by the Chicago Symphony Orchestra performed in November 2014. In addition to architecture, Gehry has made a line of furniture, jewelry for Tiffany & Co., various household items, sculptures, and even a glass bottle for Wyborowa Vodka. His first line of furniture, produced from 1969 to 1973, was called "Easy Edges", constructed out of cardboard. Another line of furniture released in the spring of 1992 is "Bentwood Furniture". Each piece is named after a different hockey term. He was first introduced to making furniture in 1954 while serving in the U.S. Army, where he designed furniture for the enlisted soldiers. In many of his designs, Gehry is inspired by fish. "It was by accident I got into the fish image", claimed Gehry. One thing that sparked his interest in fish was the fact that his colleagues are recreating Greek temples. He said, "Three hundred million years before man was fish....if you gotta go back, and you're insecure about going forward...go back three hundred million years ago. Why are you stopping at the Greeks? So I started drawing fish in my sketchbook, and then I started to realize that there was something in it." As a result of his fascination, the first Fish Lamps were fabricated between 1984 and 1986. They employed wire armatures molded into fish shapes, onto which shards of plastic laminate ColorCore are individually glued. Since the creation of the first lamp in 1984, the fish has become a recurrent motif in Gehry's work, most notably in the Fish Sculpture at La Vila Olímpica del Poblenou in Barcelona (1989–92) and Standing Glass Fish for the Minneapolis Sculpture Garden (1986). Gehry has previously collaborated with luxury jewelry company Tiffany & Co creating six distinct jewelry collections: the Orchid collection, Fish collection, Torque collection, Equus collection, Axis collection and Fold collection. In addition to jewelry, Gehry designed other items including a distinctive collector's chess set as well as a series of tableware items including vases, cups and bowls for the company. In 2004, Gehry designed the idiosyncratic official trophy for the World Cup of Hockey. In 2014, Gehry was one of the 6 "iconoclasts" selected by French fashion house Louis Vuitton to design a piece using their iconic monogram pattern as part of their CELEBRATING MONOGRAM campaign. In 2015, Gehry designed his first yacht. Gehry's firm was responsible for innovation in architectural software. His firm spun off another firm called Gehry Technologies that was established in 2002. In 2005, Gehry Technologies began a partnership with Dassault Systèmes to bring innovations from the aerospace and manufacturing world to AEC and developed Digital Project software as well as GTeam software. In 2014, Gehry Technologies was acquired by software company Trimble Navigation. Its client list includes Diller Scofidio + Renfro, Herzog & de Meuron, Jean Nouvel, Coop Himmelb(l)au and Zaha Hadid. In October 2014, the first major European exhibition of Gehry's work debuted at the Centre Pompidou in Paris, France. 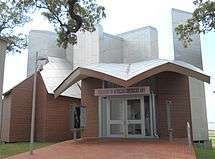 Other museums or major galleries that have done exhibitions on Gehry's architecture or design include the Leo Castelli Gallery in 1983 and the Walker Art Center in 1986 whose exhibition then traveled to the Toronto Harborfront Museum, the Houston Museum of Contemporary Art, the Atlanta High Museum, the LACMA and the Whitney Museum. 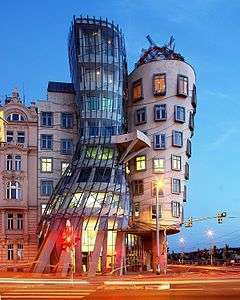 Subsequently, further museums that have done major exhibitions on Gehry's work include the Philadelphia Museum of Art, the Museum of Modern Art in 1992, the Gagosian Gallery in 1984, 1992 and 1993, the Solomon R. Guggenheim Museum in 2001, the Guggenheim Bilbao in 2002, the Jewish Museum in Manhattan in 2010 and the Milan Triennale first in 1988 and then in 2010 with an exhibition entitled "Frank Gehry from 1997." In 2015, LACMA held a major retrospective of Gehry's work. Gehry participated in the 1980 Venice Biennale's "La Strada Novissima" installation. He also contributed to the 1985 Venice Biennale with an installation and performance named "Il Corso del Coltello" done in collaboration with Claes Oldenburg. His projects were featured in the 1996 Venice Biennale. He subsequently contributed to the 2008 Venice Biennale with an installation named "Ungapatchket". In October 2015 21 21 Design Sight in Tokyo held the exhibition "Frank Gehry. I Have An Idea", curated by Japanese architect Tsuyoshi Tane. Gehry was elected to the College of Fellows of the American Institute of Architects (AIA) in 1974, and he has received many national, regional and local AIA awards. He is a Senior Fellow of the Design Futures Council and serves on the steering committee of the Aga Khan Award for Architecture. In 1952, Gehry (then Goldberg) married Anita Snyder. According to an interview with Gehry on the genealogy program Finding Your Roots, he changed his name in 1956 to Frank O. Gehry in part because of the antisemitism he had experienced as a child and as an undergraduate at USC. Gehry and Snyder divorced in 1966. He married his current wife, Panamanian Berta Isabel Aguilera, in 1975. He has two daughters from his first marriage and two sons from his second marriage. Having grown up in Canada, Gehry is an avid fan of ice hockey. He began a hockey league in his office, FOG (which stands for Frank Owen Gehry), though he no longer plays with them. In 2004, he designed the trophy for the World Cup of Hockey. Gehry holds dual citizenship in Canada and the United States. He lives in Santa Monica, California, and continues to practice out of Los Angeles. Gehry is a member of the California Yacht Club in Marina Del Rey, California, and enjoys sailing with his fiberglass-hulled yacht, "Foggy". Gehry also serves on the Leadership council of The New York Stem Cell Foundation. 1 2 Tyrnauer, Matt (30 June 2010). "Architecture in the Age of Gehry". Vanity Fair. Retrieved 2010-07-22. 1 2 3 Chollet, Laurence B. (2001). The Essential Frank O. Gehry. New York: The Wonderland Press. p. 112. ISBN 0-8109-5829-5. ↑ "In the News: Warsaw Jewish Museum In Poland". Isurvived.org. 2005-06-30. Retrieved 2011-08-30. 1 2 3 4 Karen Templer (1999-12-05). 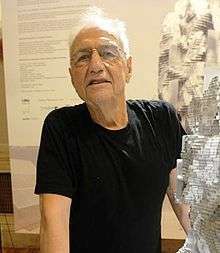 "Frank Gehry". Salon. Retrieved 2007-08-25. ↑ Lacayo, Richard; Levy, Daniel S. (June 26, 2000). "Architecture: The Frank Gehry Experience". Time. 155 (26). p. 64. Archived from the original on 2013-01-05. Retrieved March 22, 2015. ↑ "Congratulating the Alpha Epsilon Pi International Fraternity -- (Extensions of Remarks - August 02, 2013)". Library of Congress. Retrieved 2014-01-23. ↑ "Biography and Video Interview of Frank Gehry at Academy of Achievement". achievement.org. Retrieved 2015-09-14. ↑ Isenberg, Barbara (2012). Conversations with Frank Gehry. Knopf Doubleday Publishing Group. pp. 40–43. ISBN 9780307959720. ↑ "AD Classic: Norton House / Frank Gehry". ArchDaily. Retrieved 2013-05-25. ↑ Jeffrey Head (October 21, 2009), 'Frank Gehry: The Houses,' a thoughtful retrospective Los Angeles Times. ↑ "Gehry House - Frank Gehry - Great Buildings Online". Greatbuildings.com. Retrieved 2010-06-03. ↑ Tyrnauer, Matt. "Architecture in the Age of Gehry", Vanity Fair, August 2010, accessed 2012-03-27. ↑ Roston, Eric (2004-10-11). "Windy City Redux". Time. Time Inc. Retrieved 2008-07-30. ↑ Hawthorne, Christopher (2013-09-21). "Frank Gehry's Walt Disney Concert Hall is inextricably of L.A.". Los Angeles Times. Retrieved 2013-12-09. ↑ Christopher Hawthorne (January 24, 2011). 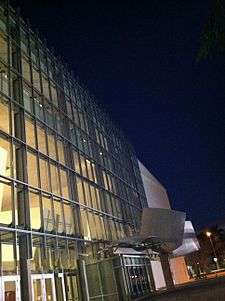 "Architecture review: Frank Gehry's New World Center in Miami Beach". Los Angeles Times. ↑ "Experience Music Project". Fodors. Archived from the original on 2010-08-18. Retrieved 2015-03-22. ↑ Nicolai Ouroussoff (2007-03-22). "Gehry's New York Debut: Subdued Tower of Light". New York Times. Retrieved 2007-08-25. ↑ Ouroussoff, Nicolai (2011-02-09). "8 Spruce Street by the Architect Frank Gehry – Review". The New York Times. ↑ "UTS City Campus Master Plan". www.uts.edu.au. Retrieved 2014-08-30. ↑ Gilmore, Heath (30 August 2014). "Frank Gehry's Sydney building sculpture revealed". The Sydney Morning Herald. Retrieved 2014-08-30. ↑ "Projects by Nouvel and Gehry Finally Moving Forward on Saadiyat Island | News | Architectural Record". Archrecord.construction.com. 2011-01-26. Retrieved 2011-08-30. ↑ "Frank Gehry and David Mirvish's Tall Order in Toronto". The Globe & Mail. 2013-12-07. Retrieved 2013-12-08. ↑ "Superstar Architects Gehry and Foster to design Battersea Power Station's High Street". Retrieved 2013-10-23. ↑ Tommasini, Anthony (2013-12-07). "Arts Hub for All May Work for None". The New York Times. Retrieved 2013-12-08. ↑ Pogrebin, Robin (2012-02-06). "Eisenhower as Barefoot Boy? Family Objects to a Memorial". New York Times. ↑ Campbell, Robert (October 13, 2012). "Pressing Pause, for Cause, On the Eisenhower Memorial". Boston Globe. ↑ Kennicott, Philip (2011-12-17). "Review: Frank Gehry's Eisenhower Memorial reinvigorates the genre". Washington Post. Retrieved 2012-04-24. ↑ "The Biomuseo, the great works of Frank Gehry". Visitpanama.com. Retrieved 2011-08-30. ↑ "Eliasson show due to open Paris' Louis Vuitton museum". The Art Newspaper. 2012-03-22. Retrieved 2012-10-21. ↑ "www.arcspace.com". www.arcspace.com. 2007-01-08. Retrieved 2011-08-30. ↑ Riding, Alan (2006-10-03). "www.nytimes.com". www.nytimes.com. Retrieved 2011-08-30. ↑ Kennicott, Philip (September 2014). "Gehry's Paris Coup". Vanity Fair. Retrieved 2014-10-24. ↑ "Frank Gehry says his 'crumpled paper bag' building will remain a one-off | Art and design | The Guardian". theguardian.com. Retrieved 2015-09-14. 1 2 "Frank Owen Gehry". achille.paris. May 28, 2015. Retrieved 2015-09-14. ↑ Witold Rybczynski, "The Bilbao Effect", The Atlantic Monthly, September 2002. ↑ Rybczynski, Witold. When Buildings Try Too Hard, Wall Street Journal, November 22, 2008. 1 2 "Frank Gehry: "I'm Not a Starchitect"". Archdaily. Retrieved 2013-12-08. ↑ "Hal Foster reviews 'Frank Gehry' edited by Jean-Louis Cohen et al · LRB 23 August 2001". Lrb.co.uk. Retrieved 2011-08-30. ↑ Favermann, Mark. "MIT Sues Architect Frank Gehry Over Flaws at Stata Center". Berkshire Fine Arts. Retrieved 2011-08-30. ↑ Cocotas, Alex. "Design for the one percent". Jacobin. Jacobin. Retrieved 7 June 2016. ↑ USC News (2011-01-18). "Architect Frank Gehry Named Judge Widney Professor". Retrieved 2011-01-18. ↑ Booth, John (2011-10-10). "The 15 Geekiest Episodes of PBS's Arthur". Wired. Retrieved 2013-08-14. ↑ Chaban, Matt (2011-09-05). "Frank Gehry Really, Really Regrets His Guest Appearance on The Simpsons". The New York Observer. Retrieved 2011-09-10. ↑ "Frank Gehry: "Don't Call Me a Starchitect"". London: The Independent. 2009-12-17. Retrieved 2013-12-08. ↑ "How to Construct an Epic Ice Cream Sandwich Like an Architect". Food & Wine. Time Inc. Affluent Media Group. 2014-05-20. Retrieved 2014-10-29. ↑ Coolhaus (2009-12-02). "Frank Behry Tribute Video!". Blogspot. Retrieved 2014-10-29. ↑ Schledahl, Peter (2014-10-27). "Frank Gehry's Digital Defiance". The New Yorker. Retrieved 2014-10-27. ↑ McKenny, Leesha (2014-10-27). "Frank Gehry gives the finger in response to accusations of "showy architecture"". Sydney Morning Herald. Retrieved 2014-10-27. ↑ Suzanne Muchnic (February 6, 1992), LACMA 'Degenerate' Exhibit to Make a Stop in Germany Los Angeles Times. ↑ William Wilson (February 15, 1991), Revisiting the Unthinkable: Nazi Germany's 'Degenerate Art' Show at LACMA Los Angeles Times. ↑ Jeffrey Fleishman (February 28, 2014), Frank Gehry and Alexander Calder, a captivating union at LACMA Los Angeles Times. ↑ "When Architects Curate: Frank Gehry’s Peter Arnell Retrospective at Milk Studios | Object Lessons | BLOUIN ARTINFO Blogs". blogs.artinfo.com. Retrieved 2015-09-14. ↑ "Architect Frank Gehry to Create Set Design for Chicago Symphony Orchestra Focused on Pierre Boulez". broadwayworld.com. Retrieved 2015-09-14. ↑ "American Masters: Frank Gehry". Retrieved 2008-11-17. ↑ Frank Gehry: Fish Lamps, November 7 - December 21, 2013 Gagosian Gallery, London. ↑ "Frank Gehry's Tiffany Chess Set Is a Miniature Architectural Marvel". gizmodo.com. Retrieved 2015-09-14. ↑ Adams, Noah (2004-09-03). "Frank Gehry's World Cup of Hockey Trophy". The New York Times. Retrieved 2014-10-24. ↑ "Louis Vuitton: CELEBRATING MONOGRAM Project". celebrating.monogram.lv. Retrieved 2015-09-14. ↑ Ward, Vicky (2015-10-05). "Frank Gehry's First-Ever Yacht Looks Like Nothing You've Ever Seen". Town & Country. Retrieved 2015-10-13. ↑ Appelbaum, Alec (2009-02-11). "New York Times: Frank Gehry's Software Keeps Buildings on Budget". The New York Times. Retrieved 2012-12-13. ↑ Shaunacy Ferro (September 11, 2014), Frank Gehry's Software Company Acquired Fast Company. ↑ Giovannini, Joseph (2014-10-20). "An Architect's Big Parisian Moment Two Shows for Frank Gehry, as His Vuitton Foundation Opens". The New York Times. Retrieved 2014-10-24. ↑ "Frank Gehry - LACMA". ↑ "Frank Gehry: I have an idea". ↑ "Lifetime Honors - National Medal of Arts". Nea.gov. Retrieved 2011-08-30. ↑ "Lifetime Achievement Winner: Frank Gehry". Cooper-Hewitt National Design Museum. ↑ "The Governor General of Canada > Find a Recipient". gg.ca. Retrieved 2015-09-14. ↑ "Frank Gehry: My days as a young rebel". TED Talks. 1990. Retrieved September 29, 2015. ↑ "Frank Gehry: A master architect asks, Now what?". TED Talks. 2002. Retrieved September 29, 2015. ↑ Baurick, Tristan (May 13, 2004). "Architect's love of the game inspiration behind Cup trophy", Ottawa Citizen, p. C2. ↑ "The New York Times". nytimes.com. Retrieved 2015-09-14. ↑ "Leadership Council". nyscf.org. Retrieved 2015-09-14. Isenberg, Barbara (2009). Conversations with Frank Gehry. New York: Alfred A. Knopf. ISBN 978-0-307-26800-6. Gehry, Frank O.; Colomina, Beatriz; Friedman, Mildred; Mitchell, William J.; Ragheb, J. Fiona; Cohen, Jean-Louis; Solomon R. Guggenheim Museum (Corporate Author); Museo Guggenheim Bilbao (Corporate Author) (May 2001). Frank Gehry Architect (Hardcover). Guggenheim Publications. p. 390. ISBN 978-0810969292. .
Dal Co, Francesco; Forster, Kurt W.; Arnold, Hadley (1998). Frank O. Gehry: The Complete Works. New York: The Monacelli Press. ISBN 978-1-885254-63-4. Bletter, Rosemarie Haag; Walker Art Center (1986). The Architecture of Frank Gehry. New York: Rizzoli. ISBN 0-8478-0763-0. ISBN 978-0-8478-0763-5. Friedman, Mildred (ed. ); Sorkin, Michael (December 17, 1999). Gehry Talks: Architecture + Process (Hardcover) (1st ed.). New York: Rizzoli. ISBN 978-0-8478-2165-5. Gehry, Frank O. (2004). Gehry Draws. Violette Editions. ISBN 978-1-900828-10-9. Goldberger, Paul (2015). Building Art: The Life and Work of Frank Gehry. New York: Alfred A. Knopf. ISBN 9780307701534. OCLC 913514521. Isenberg, Barbara (2009). Conversations with Frank Gehry. New York: Alfred A. Knopf. ISBN 0-307-26800-4, ISBN 978-0-307-26800-6. Richardson, Sara S. (1987). Frank O. Gehry: A Bibliography. Monticello, Ill.: Vance Bibliographies. ISBN 1-55590-145-X. van Bruggen, Coosje (December 30, 1999) . Frank O. Gehry: Guggenheim Museum Bilbao (Hardcover) (1st ed.). New York: Guggenheim Museum Pubns. ISBN 978-0-8109-6907-0. Wikimedia Commons has media related to Frank Gehry. "Frank Gehry collected news and commentary". The Guardian. "Frank Gehry collected news and commentary". The New York Times.